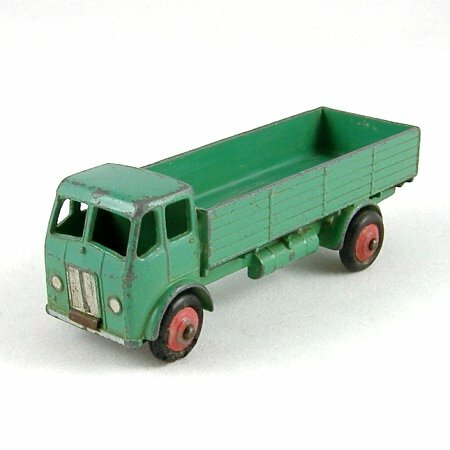 Based on a Leyland vehicle, this model was introduced in 1948 as number 25r and renumbered to 420 in 1954. This is one of the less common colour schemes, mid green with silver grille/lights and red wheels. The tyres are smooth black and the axles are rounded. There is a small tinplate base at the front and a tow hook at the rear. This example is in fair-to-good condition, with general playwear. The tyres are original: one of the front ones has deteriorated more than the others.